Designated in October 1989 and fully opened in 1992, Interstate 68 replaced the second definition of U.S. 48 along the National Freeway in northeast West Virginia and the panhandle of Maryland between Interstate 79 and Interstate 70. The route provides an alternative to I-70 for traffic headed between Baltimore and Washington to southwestern Pennsylvania and Ohio. Extension of Interstate 68 west from Morgantown to Wheeling via Moundsville, West Virginia was discussed in September 2000. 26 alternative routes (including a north-south route along U.S. 250 from Hundred to Fairmont via Mannington) for Interstate 68 were presented by the West Virginia 2/Interstate 68 Authority, but no final routing was determined. The West Virginia 2/Interstate 68 Authority was created by the West Virginia State Legislature in 1997 with two mandates: focus on widening West Virginia 2 from Parkersburg to Chester and extend Interstate 68 westward to the Ohio River. Interstate 68 was originally constructed as U.S. 48, and U.S. 48 was decommissioned once the freeway was complete and accepted into the Interstate Highway System. A portion of Interstate 68 east of Cumberland parallels U.S. 40. The histories of both Interstates 68 and 97 are tied together. Maryland originally applied to AASHTO to add the designation of Interstate 68 to the U.S. 50 freeway (John Hanson Highway) east from the Capital Beltway (Interstate 495) to a point west of Annapolis on November 15, 1975. AASHTO conditionally approved the western reaches of the route as Interstate 197 while approving the remainder east toward Annapolis and the eventual alignment of I-97 north to Interstate 695 outside Baltimore as Interstate 97. U.S. 48 between Morgantown and Cumberland was the second route of U.S. 48 posted across the U.S. The 1926-34 route joined the San Francisco Bay area in California with the Central Valley. 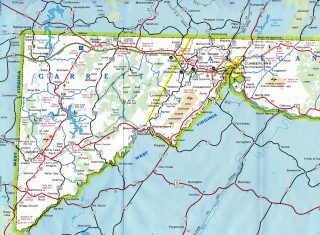 The newest corridor was established in 2002 along Corridor H, an expressway route from Elkins, West Virginia to I-81 near Strasburg, Virginia. The next change took place in 1981, with Maryland again opting to redesignate U.S. 50 between the Capital Beltway and the Annapolis area as Interstate 68. The request specified replacing the east-west leg of I-97 and the previously approved I-197 alignment along the John Hanson Highway with I-68. AASHTO withheld action on this request at their meeting on June 25th of that year. The request was altered with I-68 proposed to replace the east-west leg of I-97 and Interstate 168 over I-197. This was approved on October 3, 1981 but subjected to FHWA concurrence. A third request went to AASHTO on June 7, 1989, with Maryland opting both to renumber Interstate 68 along the U.S. 50 freeway as Interstate 595 and applying I-68 instead to the route of U.S. 48 between I-79 near Morgantown, West Virginia and I-70 at Hancock, Maryland. This too was subject to FHWA concurrence and ultimately approved. 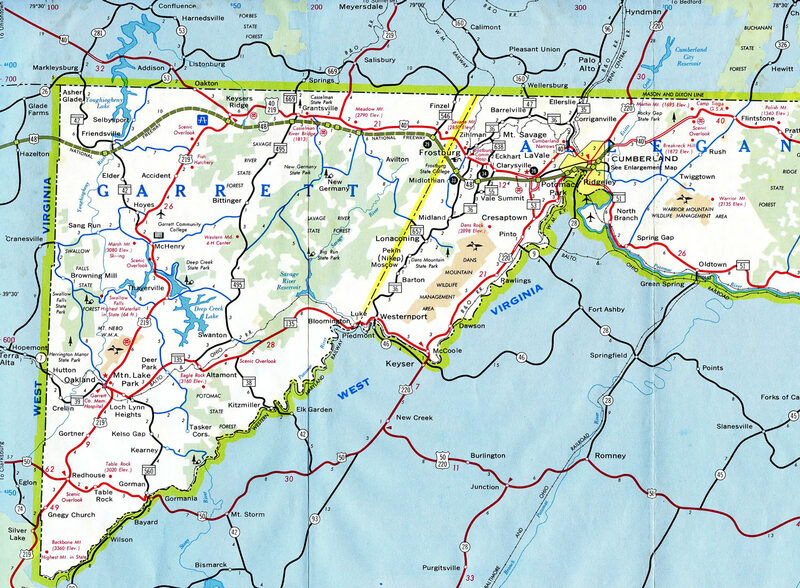 The westernmost reaches of the National Freeway showed up on the 1966 Maryland Official Highway Map as the Appalachia Corridor east from the West Virginia state line to Maryland 53 outside Cumberland. The viaduct through Cumberland was already under construction at this time. By 1972, the National Freeway was opened from Maryland 658 (Exit 40) to Naves Cross road (Exit 46). The route was under construction from Keyers Ridge westward. The 1973 edition of the state map showed the National Freeway extended west from Exit 40 to Maryland 36 (Exit 34) at Frostburg. U.S. 48 first appears along the National Freeway in 1974, with more of the route opened west to Maryland 546 at Exit 29. The 1976 state map showed U.S. 48 open west from U.S. 219 into West Virginia. All of the route west from Cumberland was completed the following year. Included as Appalachian Corridor E, I-68 within the Mountaineer State was initially constructed between 1970 and 1976 at a cost of $113 million.1 The rest of the road was upgraded to Interstate standards by 1992. Interstate 68 ends sign posted two miles ahead of the directional T interchange with I-70. A similar advisory sign is installed on Interstate 70 eastbound approaching the Baltimore Beltway (Interstate 695). Photo taken by Adam Prince (10/00). Motorists bound for Interstate 70 west and U.S. 522 north are directed into the left-hand lane as I-68 spans Creek Road. Breezewood is only 25 miles north of this junction. Photo taken by Tim Reichard (08/25/02). Two lanes continue east onto Interstate 70 & U.S. 40 east toward Hagerstown (Exit 82B) as Exit 82C branches northward to Fulton County, Pennsylvania. The city of Hagerstown and Interstate 81 are 26 miles to the east. Photo taken 10/12/01. Exit 82A separates from the transition onto I-70 east for the adjacent departure of U.S. 522 south to Hancock and Berkeley Springs, West Virginia. This ramp travels separate from the I-70 mainline split of U.S. 522. Photo taken 10/12/01. Tonoloway Ridge and Sideling Hill appear along the western horizon as Interstate 68 begins westbound. Photo taken 06/24/12. This assembly included the first I-68 westbound shield. It was replaced after 2008 and now omits U.S. 40. U.S. 40 follows the freeway otherwise west to Exit 14. Photo taken by Tim Reichard (08/25/02). This sign advises of the junction with Interstate 68 some 58 miles east of the interchange, near Frederick on westbound Interstate 70. Photo taken by Jeff Royston (06/10/06). Interstate 70 west at the *Maryland* 68 interchange, Exit 18. There is also a sign posted for this interchange to clarify that the exit leads to Maryland 68 not Interstate 68. This interchange is only situated 17 miles from the eastern terminus of I-68. A numbering coincidence such as this is prohibited in some states such as California, but is not the case in the Free State. Interstate 97 for instance, is within 30 miles of Maryland 97. Photos taken by Tim Reichard (08/25/02). The first guide sign for Interstate 68 is posted at Exit 3 for Maryland 144 on Interstate 70 westbound. This state route is the original alignment of U.S. 40, which parallels I-68 for the first four miles. Note that U.S. 522 also appears, as it travels north-south within the vicinity of the I-68 terminus. Photo taken 06/24/12. A left-hand ramp brings U.S. 522 north onto Interstate 70 west just ahead of the separation with Interstate 68 & U.S. 40 (Exit 1A). U.S. 522 northbound continues with I-70 3.4 miles to Exit 168 at Warfordsburg, Pennsylvania. Photo taken 06/24/12. Interstate 68 & U.S. 40 west depart from the left-hand side via a two-lane ramp immediately to the north of the directional T interchange with U.S. 522. Photo taken 06/24/12. The split of Interstate 68 & U.S. 40 west from Interstate 70 west & U.S. 522 north. Cumberland, Maryland lies 38 miles to the west, while Morgantown, West Virginia is an additional 71 mile drive. Photo taken 06/24/12. Heading south from Warfordsburg to the west of Cove Ridge, motorists along I-70 east & U.S. 522 south see the first sign for I-68 & U.S. 40 west. Buck Valley Road parallels the freeway to the west as the former U.S. 522. Photo taken 06/24/12. SR 3001 (old U.S. 522) passes over I-70 east & U.S. 522 south, one half mile to the north of the directional T interchange with Interstate 68 & U.S. 40 west. Photo taken 06/24/12. Exit 1A departs from Interstate 70 east just beyond the Maryland state line. Interstate 68 winds west across Tonoloway Ridge and Sideling Hill over the next ten miles. The freeway passes through s a 340-foot deep rock cut across Sideling Hill.5 Photo taken 06/24/12. A single lane ramp takes travelers onto I-68 & U.S. 40 west from I-70 east & U.S. 522 south. U.S. 522 splits with I-70 via a left-hand ramp immediately to the south while U.S. 40 merges onto I-70 east to Exit 9 near Ernstville. Photo taken 06/24/12. Replaced guide sign for I-68 & U.S. 40 west, posted two miles north in Fulton County, Pennsylvania. Photo taken by Steve Hanudel (08/12/05). This sign for I-68 was replaced after 2009. Interstate 68 (National Freeway) and U.S. 40 are merged through much of the route from here west to Cumberland and beyond. Alternate U.S. 40 and/or Maryland 144 generally follow the old alignment of U.S. 40, while U.S. 40 itself stays on Interstate 68 all the way to Exit 14 near Keysers Ridge. Photo taken by Steve Hanudel (08/12/05). The initial sign for Interstate 79 appears as Interstate 68 enters a valley fed by Cabun Creek east of U.S. 119 (Exit 1). Photo taken 06/24/12. Interstate 68 meets U.S. 119 at a folded diamond interchange just one mile to the east of the directional T interchange with Interstate 79. Photo taken 06/24/12. A third westbound lane accompanies I-68 west from U.S. 119 to the end at I-79. Fairmont is nine miles to the south, with the capital city of Charleston another 140 miles further southwest. Photo taken 06/24/12. An end shield for Interstate 68 was added to the Interstate 79 sign bridge after 2008. Washington, Pennsylvania, where I-79 ties in with Interstate 70, is 46 miles to the north. Photo taken 06/24/12. Passing between the Price Hill and Harmony Grove communities, Interstate 79 winds southeast on the two mile approach to Interstate 68 east (Exit 148). Photo taken 10/12/01. Interstate 79 lowers to span the Monongahela River ahead of the two-lane ramp (Exit 148) for Interstate 68. Photo taken 10/12/01. A third diagrammatic sign outlines the departure of Exit 148 for I-68 east as I-79 south leaves the area. Interstate 68 encircles the south side of Morgantown to Cheat Lake, ten miles to the east. Photo taken by Brian LeBlanc (03/02). Exit 148 takes travelers east onto Interstate 68 as part of a long distance route from Ohio and Southwestern Pennsylvania to Baltimore and Washington. Photo taken 08/07/04. Interstate 79 expands to three northbound lanes ahead of the two-lane off-ramp (Exit 148) for Interstate 68 east. I-68 reaches Cumberland, Maryland in 75 miles. Photo taken 08/07/04. Interstate 79 north separates with I-68 east. Both routes serve Morgantown over the next seven miles. Photo taken 08/07/04. “I-68 Extension Gets Important Federal Endorsement.” WTOV-9 September 9, 2003. “Proposed I-68 Project Will Become Eligible for Federal Funding.” Wheeling (WV) News-Register, September 10, 2003. “Plans Moving Forward for Moundsville-to-Morgantown Highway.” The State Journal, September 15, 2014. “Western Md. thumbs for a ride to prosperity along Interstate 68.” The (Baltimore) Sun, July 28, 1991. Economic Development History of Interstate 68 in Maryland, FWHA web site, Office of Planning, Environment, & Realty (HEP). Page updated December 2, 2015.